St. Cloud State has a large menu of intercollegiate, intramural and wellness offerings. Huskies Athletics is home to NCAA Division I and II teams with rich traditions of success. Our student-athletes, coaches and facilities have helped the Huskies rank among the best NCAA programs in the region. Purchase tickets at scsutickets.com. 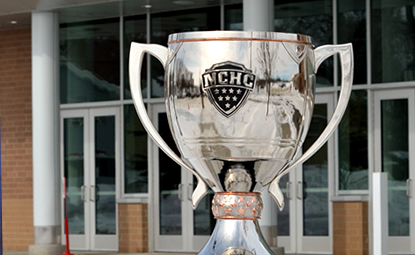 Women's and men's hockey teams compete at the NCAA Division I level. Men are in the National Collegiate Hockey Conference. Women are in the Western Collegiate Hockey Conference. The teams skate in the Herb Brooks National Hockey Center. Sixteen NCAA Division II teams compete in the Northern Sun Intercollegiate Conference, arguably the nation's best NCAA Division II conference. Women's Huskies Nordic Skiing competes independently at the D-II level. Campus Recreation offers fitness and wellness programs, intramurals and sports clubs, and outdoor programs. The school's mascot is Blizzard T. Husky.